The governments of Canada and Alberta are working together to make long-term infrastructure investments that will create economic growth, sustain well-paying jobs, build inclusive communities and support a low carbon, green economy – leading to a higher quality of life for all Canadians. 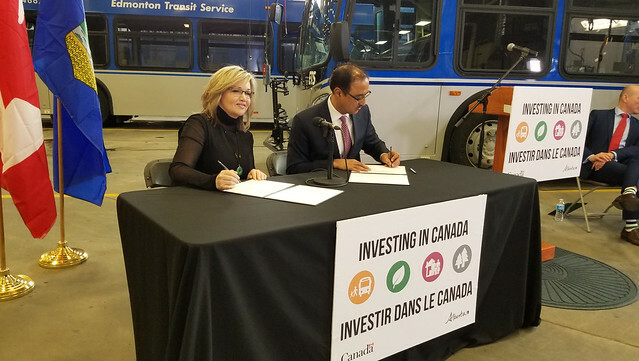 Alberta Infrastructure Minister Sandra Jansen and Minister of Infrastructure and Communities Amarjeet Sohi sign the Investing in Canada Infrastructure Plan bilateral agreement. Today, Amarjeet Sohi, federal Minister of Infrastructure and Communities, and Sandra Jansen, Minister of Alberta Infrastructure, announced the signing of a bilateral agreement that will provide more than $3.3 billion in federal funding through the Investing in Canada plan over the next decade for infrastructure projects. These projects will be cost-shared with the Alberta government, municipalities and other partners. This new funding will see the Government of Canada and the Government of Alberta make unprecedented investments in public transit, green infrastructure, recreational, cultural, and community infrastructure, as well as rural and northern communities. The funding builds on Alberta’s 2018 Capital Plan, which commits $26.6 billion over five years to support priority infrastructure projects across the province. Under the first phase of the plan, Infrastructure Canada has approved nearly 3,500 projects across Canada worth a combined investment of more than $8.4 billion, including projects worth more than $1.1 billion in Alberta. This marks the sixth new long-term infrastructure agreement the Government of Canada has signed with provincial and territorial partners. Alberta will receive a total of $3,397,857,039 from 2018 to 2028 through this agreement. $2,096,548,228 to build new urban transit networks and service extensions that will transform the way Canadians live, move and work. $1,001,082,871 to support greenhouse gas emission (GHG) reductions; enable greater adaptation and resilience to the impacts of climate change and climate-related disaster mitigation, and ensure that more communities can provide clean air and safe drinking water for their citizens. $140,575,109 towards community, culture and recreation infrastructure to build stronger communities and improve social inclusion. $159,650,831 to support projects that improve the quality of life in rural and northern communities by responding to rural and northern specific needs. To ensure our partners consider opportunities to mitigate greenhouse gas emissions or better adapt to climate change during the project development stage, a new climate lens will be applied to certain projects. Partners will also report on how larger projects are creating job opportunities for a broader array of Canadians in the construction industry and related sectors through a new Community Employment Benefits framework.